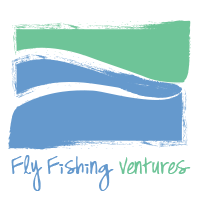 Fly Fishing Identity: FlyLady? Flychick? Flygirl? Men have it easy in this department and I imagine they have never looked at this name thing from a female perspective. They are Flyfisherman. A.K.A. Fisherman, the universal meaning for those that cast a line. Considering guys started the activity, I guess it’s only fair they get the easiest designation. But when you are female, the lines of personal name possesion become a bit fuzzy. Hi~ My name is Rebecca and I am a Flyfisher–er, umm–man? Sort of, but that’s a fairly manly designation and I wear a bra so next…. There’s Flyfisherperson. A general sort of claim. But I don’t think so. That is like getting the generic version of a G. Loomis fly rod. No matter how you hold it, it’s just not the same. Flyfisherwoman? Flyfishingfemale? Flyfishlady? Fly Fishing WOman? Perfectly respectable designations I suppose. This name thing may seem trivial when it comes time to skip flies across the water, and it is, but when I’m writing, when I’m talking to someone off the bank, I always get stuck on this simple act of title possesion. I suppose Fly fishing woman is the go too standby, but it’s also a mouth full and frankly, I think it’s formal, stiff and sounds like I should be standing on a podium rather than a riverbank. 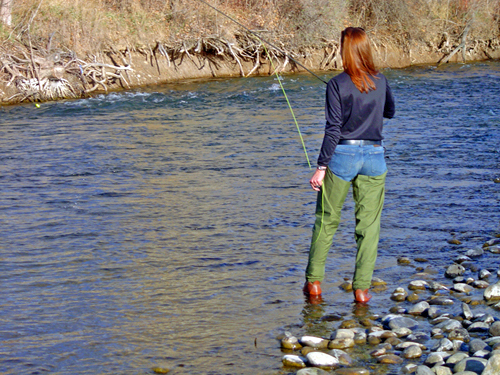 I am Rebecca, I am a fly fishing WOMAN, hear me zing a fly line 3 inches from your ear, sort of moment. 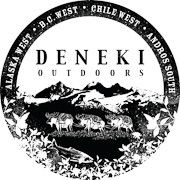 I think I’m writing about this today because I’ve been fishing all my life, flyfishing for the past 14 or so years and I’ve yet to discover the perfect word sequence that sounds… just right. This entry falls into an irrelevant meandering category that happens to annoy me at times. It happens, annoyance that is. Of course I can live with this name annoyance. There are loads of other annoyances to be found out on the actual riverbank I have a hard time with, but that’s a whole ‘nother blog entry…..
How about, I am Rebecca and none of this matters except the fact I fling fake flies fanatically. Great article Rebecca! I am going to do a feature and advertise your blog on mine with this article. Keep writing fly fishng WOMAN. The poetry of your comment Trout Whisperer is enough to make me at peace with….just fishing. A fisher. Just came across your site–very enjoyable. You could come up with something cutesy where you don’t have to worry about gender: trout maven, pike pursuer, cutthroat stalker (oops, already taken), etc. Or, you could try to work the gender issue like the ones in your post. However, it’s kind of like most of us who insist our fishing be linked to the word “fly.” I wonder why we fly anglers often insist on that word “fly” be in there? I’m certainly guilty when some asks (or states), “Oh, you like to fish?” I’m quick to add, “FLY fish.” It’s that snobby thing, I guess. As a guy, I have no idea how that must feel, as a lady, to frequently have “-man” attached to things I do: fisherman, outdoorsman, chairman, etc. I can imagine if I group up in a world where everything was “-lady”: fisherlady, outdoorslady, chairlady, etc. That’s gotta stink. Even fe”male” and wo”man”–geez! Anyhow, I would say you are an angler. If you must insist on using “fly,” then you are a fly angler. Angler is non-gender specific. How about Flyfisher? Again, non-gender specific. First, thank you for coming by and offering up your advice! There’s really no simple solution, though your proposal to cut off the man part (cringe!) seems to make sense. 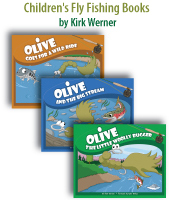 “Fly Fisher” is certainly easier to type or say than One Who Engages in Fly Fishing. i’ve always used “flyfisher”, as opposed to “baitfisher”, or “wormfisher”. I vote for flyfisher, but only in the company of other fishing fans. I’d say that as a female flyfisher, you deserve the title angler. After all was it not a woman, Dame Juliana Berners, who first chronicled the art in “Treatyse of fysshynge wyth an Angle”? Personally, I believe that what matters most in this pastime is how well you fish; gender is of no concern. They always catch bigger fishes too . .
My name is Rebecca and I am a serious flyfishing enthusiast! !